The sculptor made his bas-relief from a piece of Carrara marble. It was a donation for the school of San Marco Lorenzo the Magnificent. It depicts a battle scene. If you look closely, you can see quite a boy who holds a stone in his hands. He is trying to throw him. Behind the youngster is depicted the figure of an old man, who is also with a stone in his hands. The battle is really fierce: no one sees either the wounded or the dead warriors. One centaur has already been defeated, and the mob tramples it down with great fury. On the right side, the centaur is still trying to resist, but the warrior has already saddled him. Below you can see the figure of a young man who is holding on to his broken head, his minutes are already numbered, the injury is too serious. This bas-relief was made by a sculptor at the age of seventeen. Therefore, he had not yet seen the real battle, but still managed to show the cruelty of the battle. The composition clearly shows how people are destroyed in fractions of seconds. Michelangelo in his work applied the technique of high relief and multi-level processing of marble. This bas-relief combines a polished and unpolished stone. With the help of such successful combinations, the artist managed to breathe life into his creation. “The Battle of the Centaurs” conveys to the viewer the feeling of the gravity and volume of all the figures of warriors. Even the name itself has a definite meaning. By a small translation can be translated as “tombstone.” She is basically similar to her. Also, the people whom the sculptor depicted do not hold weapons in their hands, they are armed only with stones. Therefore, the meaning of this work can be explained as the victory of a stone over flesh. 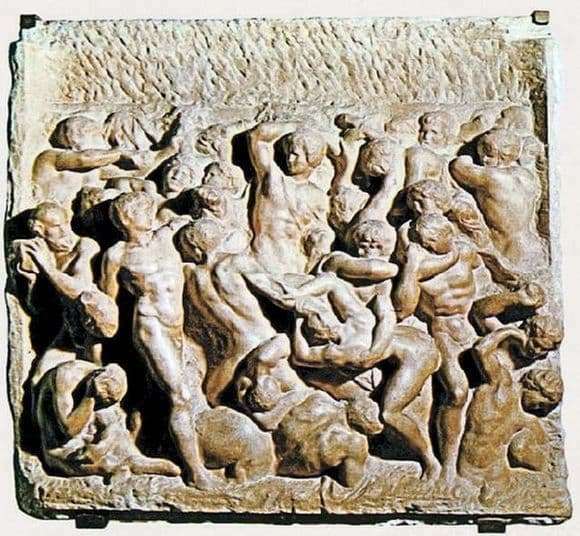 The bas-relief itself shows that this is only a small group of people, and then the battle with the centaurs continues. And there is no end to it.